If we go back to the contemporary history of neutrality or rather the non alignment movement, one can see the Burmese imprint there. Burma after gaining independence from Great Britain in 1948 was beset by civil ones and join the Colombo plan (conceived at the Commonwealth Conference of Foreign Affairs in Colombo in Jan 1950s) to get some resources for its armed forces but it was in 1954 Colombo Conference, the five participating countries (Burma India Ceylon Indonesia and Pakistan) pledge their neutrality in the Cold War, Jawaharlal Nehru of India, the most influential leader was backed by U Nu, Prime Minister of Burma in calling the Bandung Conference to create an atmosphere of corporation and put Asia and Africa in the world’s picture that pave the way to thee Non-Aligned Movement (NAM) in Bandung. As of today the movement had 120 members and 17 as observer’s countries. In the impending Cold War between China and US, it seems that Burma will play a crucial part and obviously the ex-brass will try their level best to remain in power in the so called newly emerging Burmese democracy. In the economic sphere American preeminence, can no longer be taken for granted, nor can it be assumed that a stronger, richer China is good news for America -- as successive U.S. presidents have argued since 1978. On the contrary Americans are getting the queasy feeling that a richer, more powerful China might just mean a relatively poorer, relatively weaker America. In other words, the rise of China is not a Win-Win situation for both nations. It is a zero-sum game. Respected economists like Paul Krugman and Fred Bergsten have argued that imposing tariffs would be a legitimate U.S. response to Chinese currency policies. China set to overtake the US as the world's largest economy, possibly as soon as 2016 according to an International Monetary Fund projection,Washington sees Beijing as already flexing its muscles, with increases in military spending and a harder-line in border disputes with a range of neighbors, including India, Japan, and Vietnam. As a result, the United States is seeking to make common cause with China's nervous neighbors including Burma and this is where the Burmese regime will try to exploit for its survival. By taking advantage of China overplaying its hand in the South China Sea and generally unnerving most of the region, the Obama administration is smart in reconfirming the central role in Asia. The opening of a new base in Australia is a powerful symbol of America's enduring strategic presence in the region and relations with Burma has both strategic motives as well as several other implications. 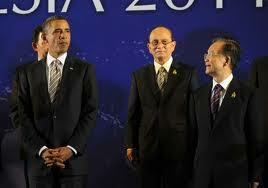 He is also taken a pro-democracy posture not only in Burma but also in the Middle East and Russia. Given these the political evolution of countries in these regions will have a direct bearing on the international strategic situation and on the nature of world order in the coming years. But Beijing is likely to be the fulcrum around which Asian relations and economies revolve—a revival of the Middle Kingdom era when China was “first-among-equals” in Asia. For Burma, despite its recent attempts to reduce China's influence and forge better political and business ties with the West, China's inevitable rise to first-among-equals status in Asia will weigh heavily on its much-smaller south-western neighbour. Daw Aung San Suu Kyi, Burma's opposition leader and an icon for politically-aware Westerners, has stressed her neutral view of China—an acknowledgment that Burma will continue to do much business with the Asian superpower regardless of its future relationship with the West. Hundreds of thousands Chinese migrants now live in Burma, and Chinese investors have put around US $12billion into the country. In addition, despite the Myitsone suspension, there are 25 other “mega-dam projects” underway in Burma, many of them Chinese-backed. So no matter what changes come to Burma or global politics in 2012, China will likely remain an important factor for decision-makers in Naypyidaw. Knowing that the New Cold War will be over natural resources rather than the old one over ideas, President Obama’s long term economic goal is laudable and most importantly is that America will be self-sufficient in oil by 2030 because of growing U.S. domestic production and Canadian output, according to Julian Lee, a senior energy analyst at the Centre for Global Energy Studies .On the other hand China will be depended more and more on foreign oil. Oil from the Middle East and African crude is currently being transported in tankers via the 900km-long Malacca Strait, that connects the Indian and Pacific Oceans, is one of the world's busiest shipping channels and around 650,000 vessels pass through it every year and roughly 80% of China's annual imports of 1.5 billion barrels of oil pass through the narrow seaway. Chinese analysts and leaders have been describing the strait, as a strategic vulnerability, drawing attention to the consequences for China that if this shipping channel were to fall into the hands of "hostile powers" or pirates or terrorists. What if the US were to block China's access to the strait in the event of a China-Taiwan conflict? Hence China is constructing an oil pipe line from the Bay of Bengal that will cut through Burma direct to China .The roughly 2,000 kilometres of pipeline starting from Kyaukpyu in Western Burma will terminate at Kunming in Yunnan province at a cost of $1.5 billion the entire cost of constructing the pipelines will be borne by China. Burma has the world's 10th-largest natural gas reserves, estimated at over 90 trillion cubic feet (tcf) in 19 onshore and three major offshore fields. Due to the proximity of Burma, and cosy relations with the tyrannical Burmese Generals, this veto-holding member of the United Nations Security Council that often prevented resolutions critical of the Junta was rewarded with the oil pipeline is expected to be completed by 2013. China's largest oil and gas company China National Petroleum Corporation (CNPC) will share the profit with the Burmese Generals. So from early 2013, Chinese oil tankers from the Middle East and Africa will be able to cross the Bay of Bengal to dock at Burma’s Western seaport and thee transport time will be cut by more than a week than via Malacca Strait. What more it is constructing a fast track railway along the pipeline that can reach within five hours to the Burmese shores and at any time the PLA which has a minimal electronic espionage system can be reinforced within hours and be a threat to India and the American base in Diego Garcia? China importing 11 percent of its oil from Iran has ignored the latest American and European move for sanctions against Iran which was not backed by the United Nations. Prime Minister Wen Jiabao tour to three oil-rich Gulf monarchies has sidestepped the issue and at the Doha Conference on Jan 18th said. “Legitimate trade should be protected, otherwise the world economic order would fall into turmoil.” as it will become the globe's largest importer of oil by mid-2013. But the Chinese leaders decision to reduce the oil imports carried by tanker coincides with the Burmese Junta offering the construction of the pipeline to Kunming clearly demonstrates the Burmese diplomacy in the New Cold War as China’s top four oil suppliers—Saudi Arabia, Angola, Iran and Russia—only Russia is supplying nearly 400,000 barrels per day to China by overland pipeline while the rest has to come via the tankers which will soon be discharging their cargo in the Burmese ports. Beijing even though it parotid to adhere to its traditional policy of non-intervention into the domestic affairs of other countries and the latest vetoed the Security Council resolution on Syria on Assad regime, is still to be seen on its stand on the young and still tender Burmese democracy as it continue to fulfill its growing hydrocarbon needs in their obsession to race with the American superpower. Now that Vice-President Xi Jinping’s is schedule to visit Washington, China openly said that the mutual trust between China and the U.S. is lagging. Washington and Beijing have been in conflict sanctions on Iranian, North Korea, Spratly Islands and most recently China’s decision to join with Russia in vetoing a U.N. Security Council resolution condemning the violence in Syria, which Susan Rice called the veto “disgusting and shameful.”Burma is lining up behind all these conflicts as the regime ploys with idea of considering joining the Cobra Gold military joint exercises that will be directed to China. In other words Burma holds the triumph card both in the energy lifeline of China and its flank defence. And definitely China cannot allow a flourishing democracy at her back door without some sort of authoritarian elements. It was here that the sordid Burmese Generals will make its presence felt and no doubt both the Non Myanmar (ethnic nationalities), and the Myanmar democracy movement led by Daw Aung San Suu Kyi including the West will have to come with some sort of a compromise. 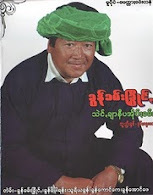 I had been freed from the Tha Yat Prison at the 13.2.2012, We met before at Maesot ,You said me to be careful if I intend to go in Burma and I read your articles ,if you have free time , please contact me by mail or phone , my mail is aungsan76@gmail.com and phone number is 73494207.